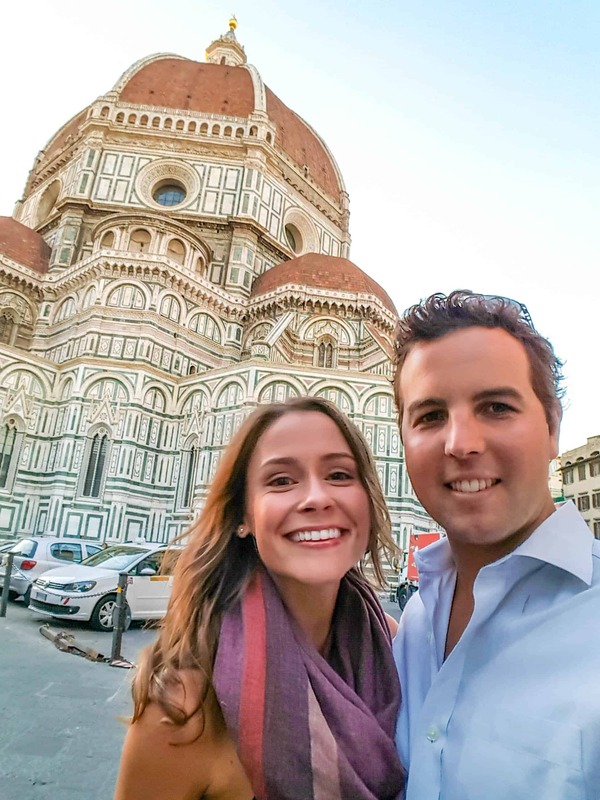 This travel guide to Florence, Italy, details everywhere we ate and drank during our 48 hours in this charming Tuscan city! 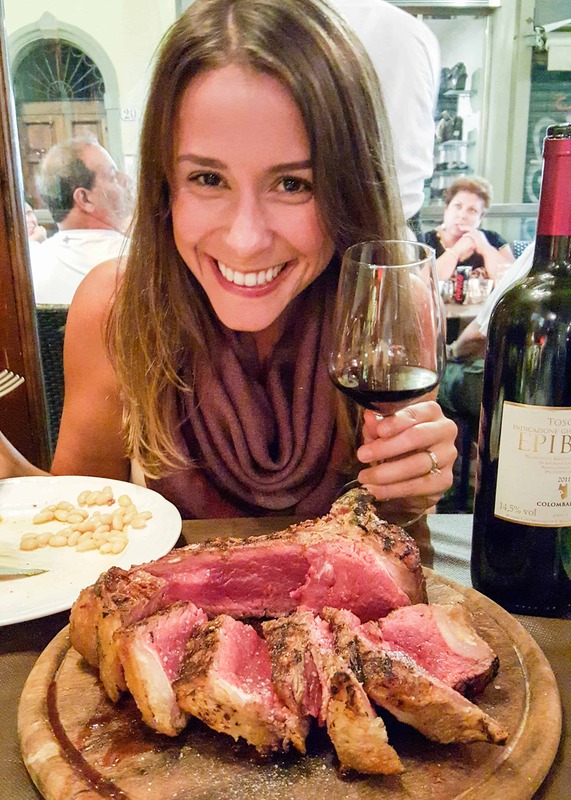 Bistecca al Fiorentina! 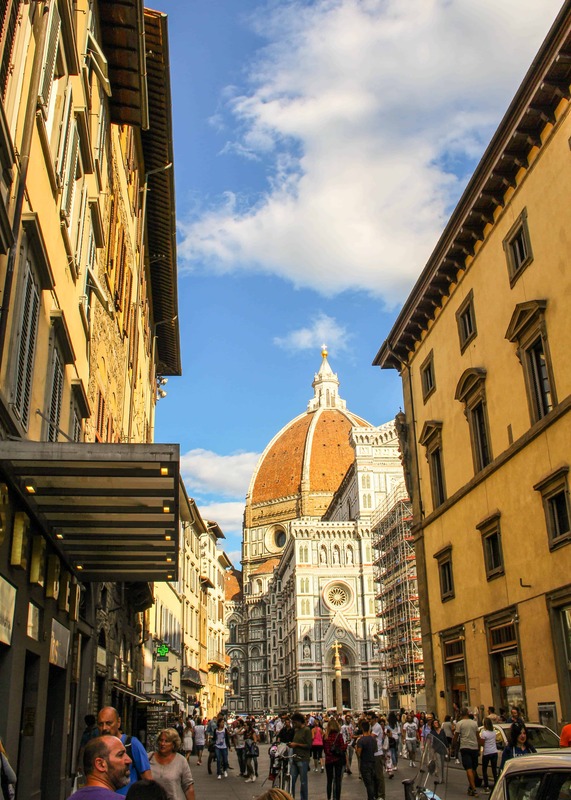 I had originally planned to combine our Tuscan adventures into one big post, but once I started writing I realized Florence needed a page all it’s own. After taking the train in from Cinque Terre, we met Silvia, the owner of the stunning apartment we rented through VRBO, who took the time to sit us down with a map and go over everything this captivating city had to offer. 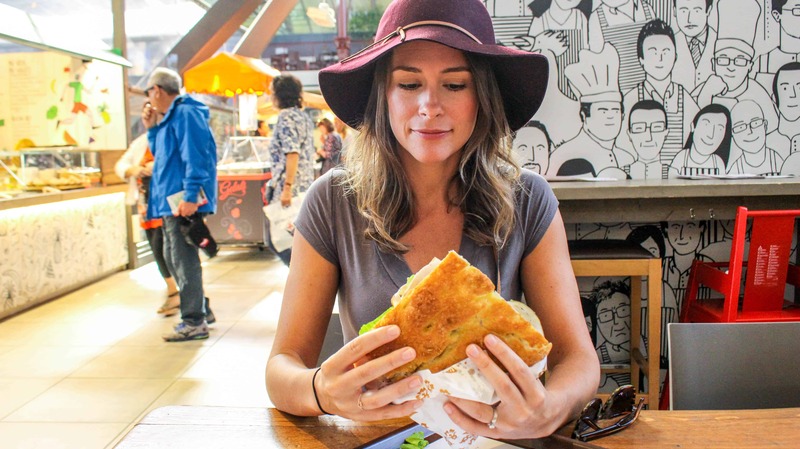 After a quick change (because, ew, train clothes), we left the apartment to cruise around town and grab a quick panino from Mercato Centrale, the bustling food market overflowing with delightful little Tuscan treats. Next, we walked outside to peruse the leather goods, where I had fun haggling my way down to a mere €28 for two small leather hand bags (a fraction of the “good price” I was originally offered). 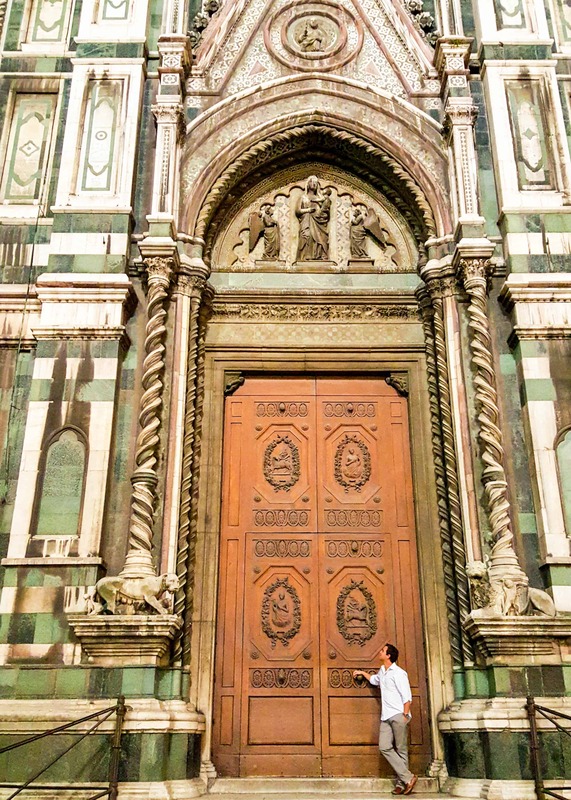 We then took a stroll over to see the famous Duomo, and as soon as we turned the corner we were taken aback by the sheer grandiosity of it. The details, the colors, the size! Pictures just cannot do it justice. You have to be there to feel its presence and seduction. It takes your breath away! That evening, our legs were sore and tired (helloooo my old friend shin splints!) from all the hiking we did the day before, and we were teetering on the edge of hanger. 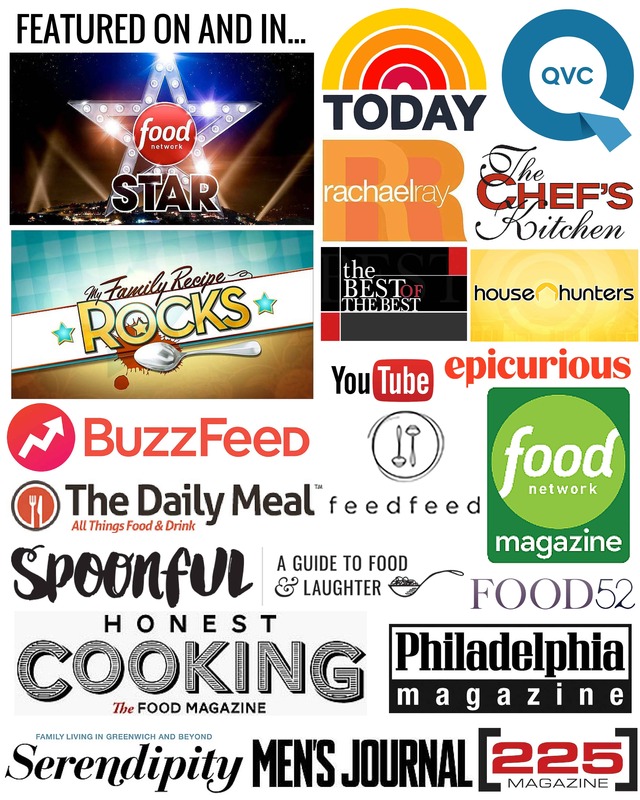 We popped into several restaurants on our list of “places to try,” but were discouraged to find out they had all been booked up for the night. Lesson number one: always make reservations. Especially on Saturday night. We settled for a meal at a so-so restaurant, and grabbed some less than stellar gelato on the way home. We tucked in for an early night in order to rise bright eyed and bushy tailed Sunday morning for day packed with activity (okay, mostly eating). Oh, and it also happened to be my birthday! 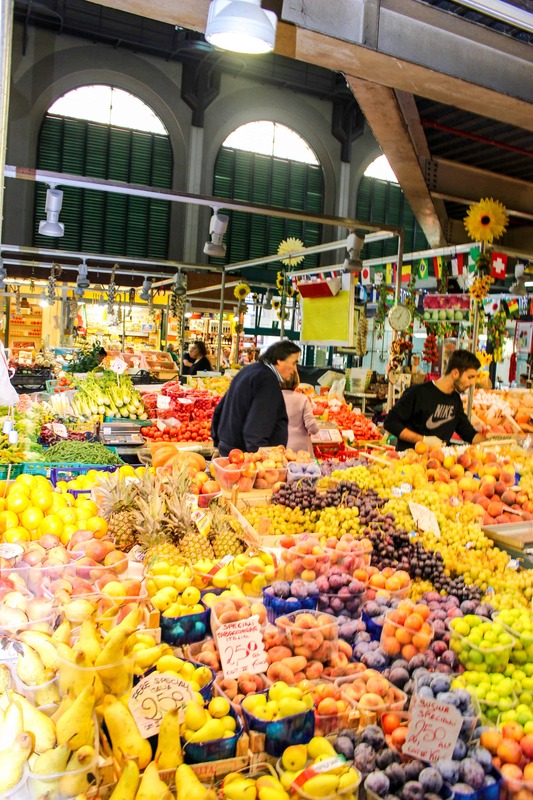 We started our day by heading back to the impressive Mercato Centrale to find something good for breakfast. The pastries looked top notch, but we couldn’t resist the look of all the salty dried meats hanging from the rafters. We ordered a sandwich of thinly sliced porchetta slapped between two pieces of focaccia and sat down to share it. It was tasty, though a little dry, but filled our bellies enough to get us through the rest fof the morning’s activities. Next stop was to the world renowned Uffizi Museum to view the impressive and historical paintings and sculptures created by the old masters I once studied in school (I was a painting minor). The building itself was a marvel to see, and the history and skill behind the art made them a privilege to witness. But… full disclosure, and I hate that I’m even admitting this, after a few hours of viewing very similar styles and subject matter, we found ourselves a little bit bored. 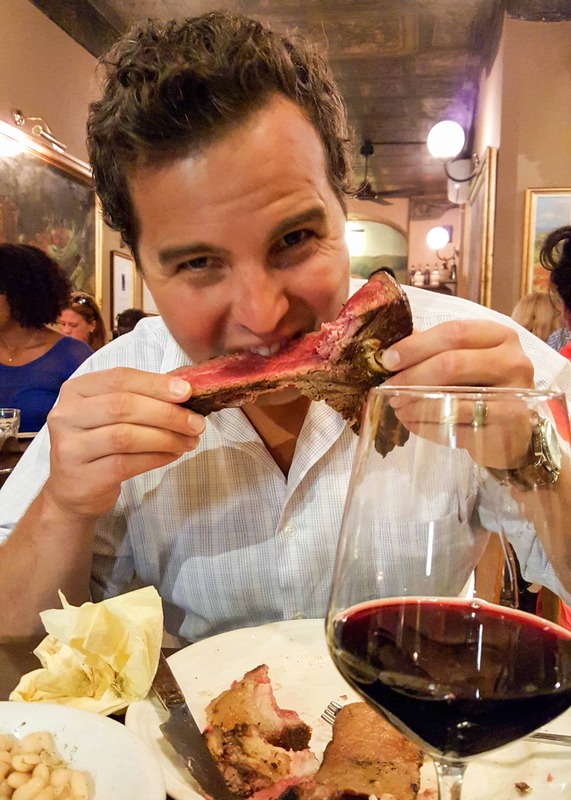 We left the museum to have lunch at Osteria Santo Spirito, where our eyes were indeed much, much bigger than our stomachs. The menu offered a reduced portion option for all of the pasta dishes, and since we were having trouble deciding which ones to pick, we opted to order four reduced portions instead of two full. Well! I had trouble believing these were actually the reduced portions, as we could barely finish the first two. Was it a mistake? Hell no! It was my birthday. We were in Italy. I was going to order all of the pasta, and no one – not no one! – was going to stop me. 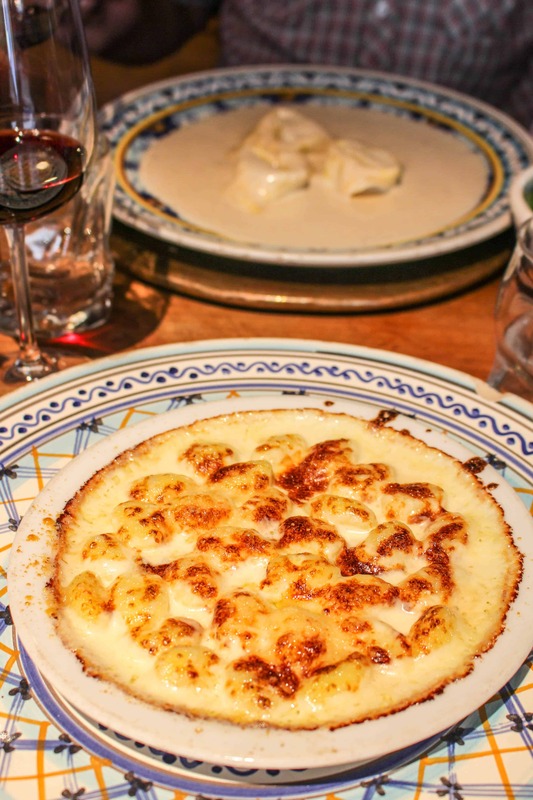 The first two rounds included a light, pillowy gnocchi baked in a fresh cheese sauce and finished with a hint of truffle oil, along with three huge cheese stuffed torteloni floating in pool of nutmeg-scented walnut cream sauce. Both were totally dreamy. These were followed by a spaghetti with a simple tomato basil sauce, and an incredibly rich and creamy zucchini risotto. They were also really good, but we could barely fit more than a few forkfuls into our mouths. Oh, we also had some salads too, loaded with artichokes, gorgonzola, walnuts and salami. Plus chianti (duh). It was obscene and luxurious and just the kind of birthday lunch a girl could hope for in Florence. We graciously paid the bill, then left to shop around the little open air market that had set up just outside. 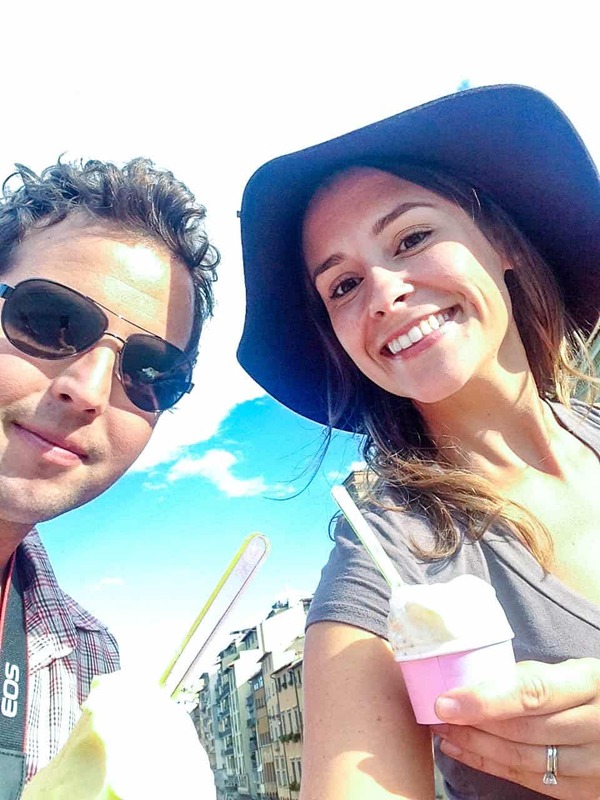 On our walk home, we stopped for some celebratory birthday gelato at Gelateria Santa Trinita. I chose my favorite flavor – ricotta with figs – along with one I’d never seen before. It was passionfruit! And it was out of this world! You know gelato is good when it tastes exactly like the fruit or nut it’s named for. This one didn’t disappoint. We sat on the ledge of the Ponte Santa Trinita and savored every last bite. 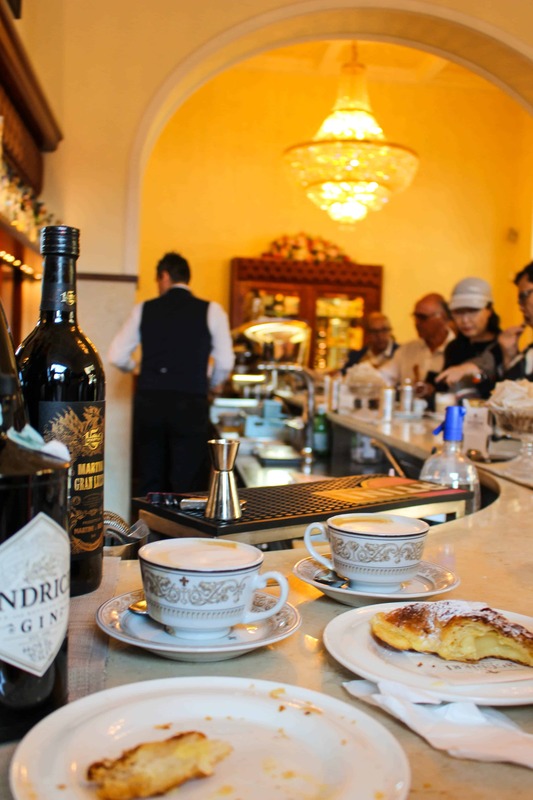 After heading back to the apartment for a nice afternoon siesta, we strolled through town a bit more before sitting down to dinner at Ristorante Giannino. We ordered a lovely bottle of Super Tuscan wine, and started the meal off with a little antipasto. We had chicken liver crostini, a specialty of the region, and a plate of Pecorino di Pienza, a Tuscan aged sheep’s milk cheese, accompanied by earthy-sweet truffle honey. 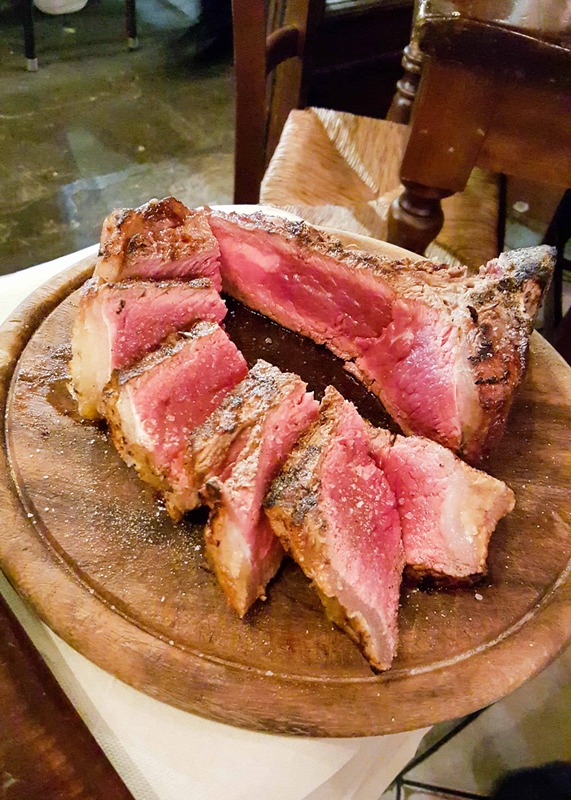 Next, the piece de resistance: the Bistecca alla Fiorentina: A thick, bone in porterhouse steak cut from the local pasteur raised Chianina cows that Tuscany is known for. 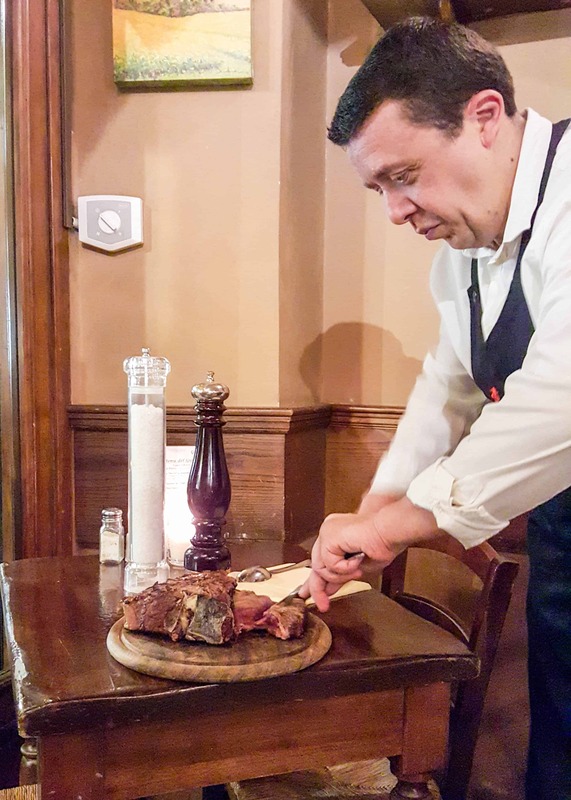 First, our server, none other than Steve Buscemi himself, brought out the bleeding hunk of meat for us to approve – a standard practice, from what I’m told. It weighed in at an impressive 1.1 kilograms (almost 2.5 lbs)! We sat in anticipation, happily sipping our wine, when suddenly Steve appeared with this glowing piece of meat in tow. It was just beautiful. He expertly carved it into thick, meaty slices and placed a few on each of our plates, cracked plenty of fresh sea salt and black pepper over top, and then drizzled them with the house’s own peppery extra virgin olive oil. The meat was bloody rare, so flavorful and incredibly juicy and tender. It was like buttah, and to date the best steak I’ve ever had. To go on the side, we ordered a simple dish of white beans, which were perfectly cooked, buttery and scented with just a hint of garlic. 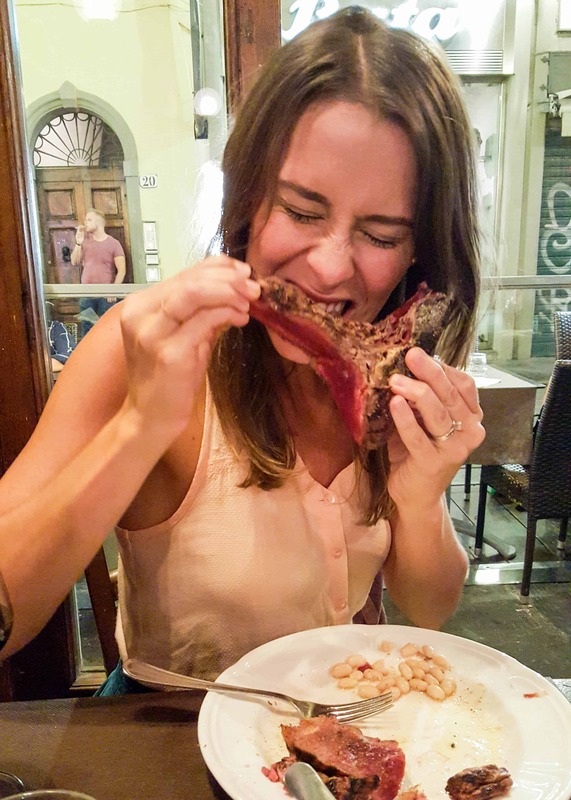 But it’s hard to get excited about beans when you have this crazy delicious, caveman-style piece of meat on your plate. I ate more steak that night than I ever have in one sitting in my life. I can’t believe we managed to nearly finish the entire steak, complete with chewing the (arguably best part) meat off the bone. There we sat, finishing up our wine, bodies so full of meat, when Steve turned the corner with a piece of chocolate torte and a lit candle in the center. The entire room burst into a chorus of Happy Birthday – in English! – and my face turned beet red. It was like being at TGIFridays in Italy but with way better food and no annoying “flair.” Steve then brought us each a glass of Vin Santo on the house, and we sipped them as we devoured the dense, chocolatey piece of cake. It was a easily the best birthday of my life, and probably the best meal, too. I’ll remember it forever. The next morning we were up and at em early in an attempt to see Michaelangelo’s the David without waiting in line before we left town. To our chagrin, The Academia where it’s located, was closed on Mondays. We chalked it up to just not being meant to be, so we walked to a nearby cafe to sip cappuccinos and eat more cream filled pastries. 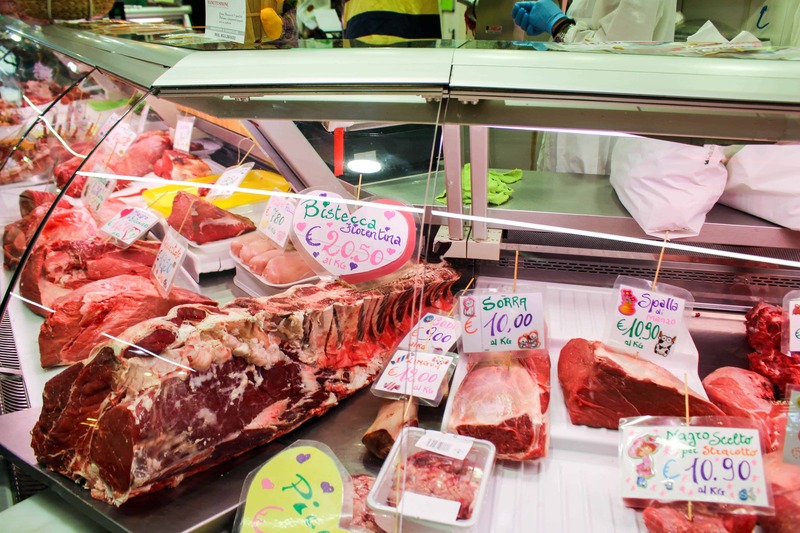 We took one final stroll through Mercato Centrale to pick up some goodies to take home, packed our bags, and hailed a cab to the Florence airport to rent a car. Next stop: the Tuscan countryside. 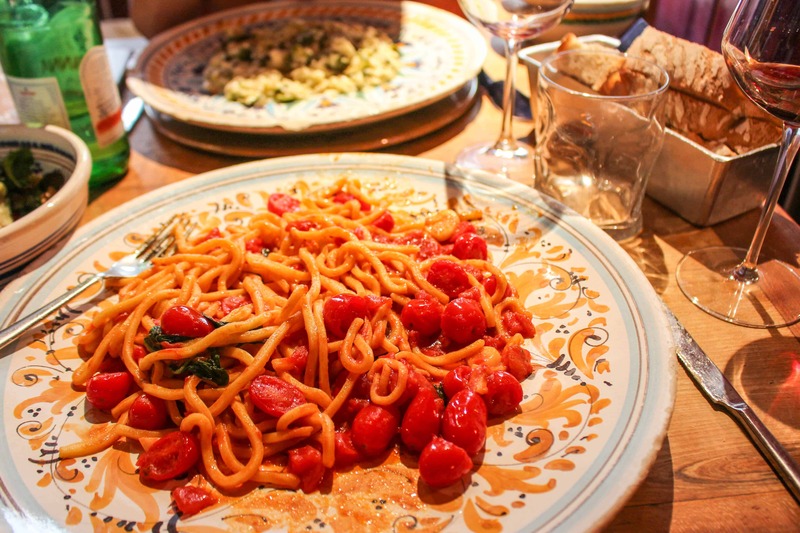 Farm life, medieval villages, wine tastings, and of course more pasta. My heart is going pitter-patter with all this goodness. 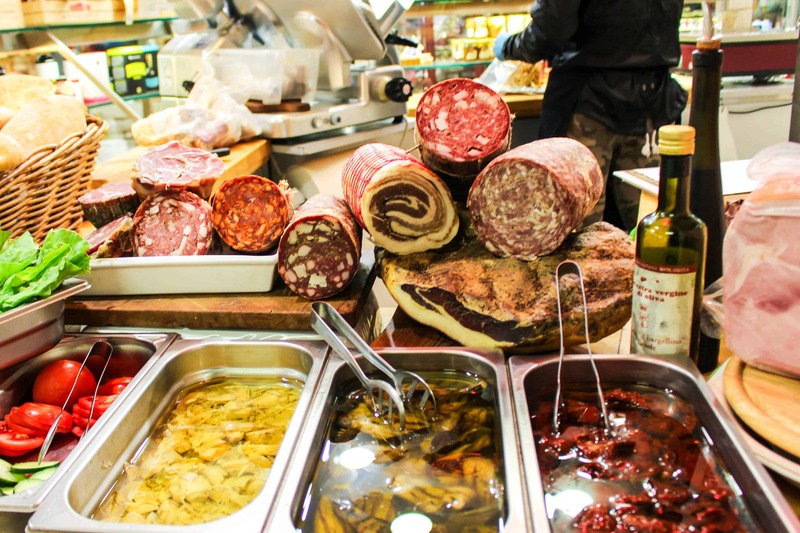 Milan and Lake Como are beautiful and Rome will always be the center of the Italian experience but I admit that Florence is my favorite city for both the art and the food. I am sorry that you missed the David – it really is awe inspiring. Maybe next time. You’re not the first one to tell me missing the David was a bigger bummer than we thought. Just an excuse to go back again!! There was plenty more for us to do and see in Florence that we didn’t have enough time for. I can’t wait for the next trip!